Every governor has signed regretful legislation, or made a disastrous pardon he or she would like a chance to re-do. California’s whacky outgoing Democrat governor has spent the last eight years trying to convince the people of California that we are to blame for droughts, wildfires and “extreme weather,” and that climate change is an existential threat to the California way of life. Showing no regrets, Gov. 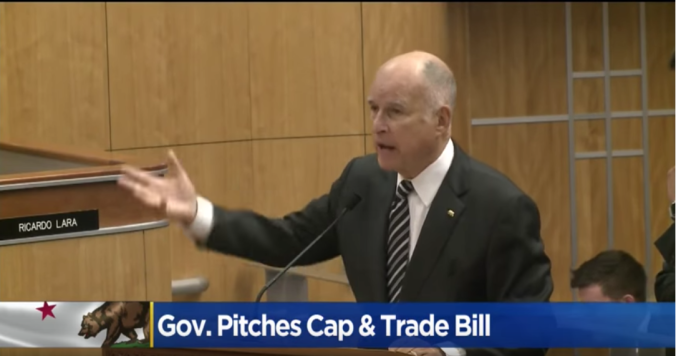 Jerry Brown calls the people “freeloaders,” and “deniers,” and has mocked our “little green lawns.” Brown even spitefully signed legislation subjecting every man, woman and child to 50 gallons of water a day in the near future… despite the state’s 189,454 miles of rivers, and that large body of water California sits on. Last year, as California residents were burned out of their towns, homes, neighborhoods, schools, hospitals and businesses, Gov. Jerry Brown was jetting around the world spouting climate change propaganda, and calling the fires California’s “new normal.” Gov. Brown had many chances to sincerely and realistically address California’s increasing wildfires since his election in 2011, but instead chose to play politics, placing his new friends at the United Nations over the people of California. What many do not know, is that California Gov. Jerry Brown vetoed a bipartisan wildfire management bill in 2016, despite unanimous passage by the Legislature, 75-0 in the Assembly and 39-0 in the Senate. SB 1463 would have given local governments more say in fire-prevention efforts through the Public Utilities Commission proceeding making maps of fire hazard areas around utility lines. In a gross display of politics, this is especially pertinent given that Cal Fire and the state’s media are now blaming the largest utility in the state for the latest wildfires. While hindsight is always 20-20, California was on fire when this bill made its way through the Legislature and on to Jerry Brown’s desk. The 129 million dead trees throughout California’s state and national forests are now serving as matchsticks and kindling. Yet, the same climate change impacts private lands as public lands, but private forests are not burning down because they are properly managed. Responding to President DonaldTrump’s Tweet, “There is no reason for these massive, deadly and costly forest fires in California except that forest management is so poor,” Gov. Brown doubled down on his “man-made climate change” blame, discounting the lack of forest management as the cause of the frequent forest and wildfires across the state. In August I interviewed Rep. Tom McClintock (R-CA), whose district includes the Yosemite Valley and the Tahoe National Forest in El Dorado County, both areas which have suffered greatly under recent wildfires. Traditional forest management had simple guidelines: thin the forest when it becomes too difficult to walk through; too many trees in the woods will compete with one another, because the best trees will grow at a slower rate. In August, Megan Barth and I wrote an article for The Daily Wire, specifically addressing why forest management has been put on the back burner. We explained how Obama-Era and Clinton-Era radical eco-terrorism thrived, made possible through drastic environmental regulations, and those “ponderous, byzantine laws and regulations” Rep. McClintock spoke of, which prevent any significant and important forest clearing, brush clearing, and dead tree removal, leaving all public forests vulnerable to wildfires. Today, only privately managed forests are maintained through the traditional forest management practices: thinning, cutting, clearing, prescribed burns, and the disposal of the resulting woody waste. And notably, privately managed lands are not on fire. In the early 1990’s, immediately following the The United Nations Conference on Environment and Development, known as the Rio Earth Summit, the Clinton administration embraced the Forest Stewardship Council, which set standards for the timber industry covering “the conservation and restoration of forests, indigenous rights, and the economic and social well-being of workers,” among other criteria, setting in motion the prevention of forest management, and the further destruction of the U.S. timber industry. In 1998, the Clinton Administration and the Forest Service implemented roadbuilding moratorium which restricted the use of or building of roads near 50 million acres of forest. “The nearly 50 million acres of roadless areas in our National Forests are an American treasure,” Earth Justice proclaims — apparently because no one is allowed to see the National Forests. By 2001, President Clinton issued the Roadless Area Conservation Policy directive, “ending virtually all logging; roadbuilding; and coal, gas, oil, and other mineral leasing in 58 million acres of the wildest remaining undeveloped national forests lands,” Earth Justice reported. Fast forward to the George W. Bush administration: “In June 2009, a federal judge sided with environmentalists and threw out the Bush planning rule that determines how 155 national forests and 20 national grasslands develop individual forest plans, governing activities from timber harvests to recreation and protecting endangered plants and animals. Clinton appointee, Judge Claudia Wilken of the U.S. District Court for the Northern District of California ruled that the Forest Service had failed to analyze the effects of removing requirements guaranteeing viable wildlife populations,” Greenwire reported. In 2012, the Obama administration issued a major rewrite of all of the country’s forest rules and guidelines. In 2015, Washington D.C. District Court Judge Ketanji Brown Jackson, an Obama appointee, rejected claims from a coalition of timber, livestock, and off-highway vehicle organizations that the Obama sustainability provisions in the 2012 Planning Rule would cause an economically harmful reduction in timber harvest and land use and an increase in forest fires. Rep. McClintock said the forest service used to auction surplus timber harvested from national forests. This served two purposes: 1) clearing, cleaning, and thinning the forest; 2) providing usable timber for a myriad of industries. The timber the forest service auctioned off more than paid for the entire federal agency, and then some. Local governments even received 25 percent of the proceeds of the lumber auctions, while 75 percent went to the federal government. “Revenues that our forest management agencies once produced – and that facilitated our forest stewardship – have all but dried up,” McClintock said. This has devastated rural communities that once thrived from the forest economy. McClintock said there were once 147 timber mills; now, there are only 29 in the country. McClintock also pointed out that despite the growing population, visitation to national forests has declined significantly as the health of our forests has decayed. “We can no longer manage lands to prevent fire or even salvage dead timber once fire has destroyed it,” he said. Private forests are still managed properly, but not forests on public lands. That sound practice grounded to a halt when the most radical environmentalists took over. Now thick, overgrown and diseased forests have become tinder boxes and are burning down in California, leaving a trail of death and destruction. “Excess timber WILL come out of the forest in one of only two ways. It is either carried out or it burns out,” McClintock added. Governor MOON BEAM should be recalled. Trying to use these tactics to push global warming is what the left does. We are all in peril because of the lefts tactics. There’s is so much proof that previous management was successful both for fire prevention and monetarily how can they vote “no”? As much as I do not like Newsom I hope he has a tiny bit of sense to change this horrible law. These are the consequences of letting Communist seize control and power over the States and Country! Obams, Brown, The Clintons, Palosie, Shumer are all Communist! Some of the reasons are the drought for several years ! Reap what yow sow liberal democrat environmentalists— Brown laughs while California burns.